We spent the entire day at the girls' school on Thursday - it was Grandparents Day. We started with a visit to the classrooms, saw the student's work, did some mental arithmetic and then a quiz. This year was a bit easier on us. With our eldest grand daughter at High School, we only had to visit with 2 girls, so we split up and after half an hour, we swapped. It worked well. Then it was time for some morning tea in the sunshine, after which we were treated to a performance of the school musical. The production was terrific, as usual, with 300 students in the show. This year was a bit different because they had all the Junior School on stage, and those from the High School who wanted to perform auditioned for some of the parts. Miss 11 had a major part, and Miss 8 was in the Junior Choir as well as in the class act. This week I managed to get the 8 Road to Oklahoma blocks done for the RSC. I surprised myself. Initially I thought that most of my yellows were pale lemony ones, but when I actually sorted them, I had everything form earthy yellows, through gold, an on to lemon. There was even a variation of brights and soft yellows. So I have grouped the different shades before I made my blocks. Much better than I thought this would be. And then I made a scrappy 25-patch. Today I made 2 Jacob's Ladder blocks in between going to have afternoon tea with the family. So that is my quota of yellow blocks made for this month's challenge. The link to the RSC at Soscrappy is here. Friday afternoon I finished repairing this quilt. It was a donation to Stitching Hearts some weeks back, but when we went to pin it for quilting, we realised that the borders were so tightly eased that there were gathers all alone each side. I brought it home to fix. You can see the rippling and unevenness in the photo. The outer border was 6" in width. I took if all off, cut the width in half which gave me twice the length of it, and inserted the light blue & white stripe to make up the 6" width. Now it sits flat. So I thought I should show you the progress I have made. And there has been some progress! If you remember, this is what I said I would make. I have overcome my anxieties, and have cut the corner pieces. (Thank you to those of you who sent me lovely comments to help me with the Maths for that). I have combined a couple of applique designs to make up my own take, and this is where I am at. The corner piece on the right is complete, and I have done the first stitches on the one on the left. I do like it! Here is a close up of the completed corner, complete with a crinkled bit (I could have straightened that before taking the photograph! But I didn't notice that until it was time to write this post, and now its pitch dark). You can see the other brilliant projects here. I am absolutely mortified! All this time I have been complaining about word verification on blogs, and yesterday afternoon there was a comment on one of my posts asking if I knew it was on mine! I have turned it off, and have to ask you lovely people to let me know if it comes on again. Today is Tuesday, and I have decided to join into Tuesday Archive at Val's Quilting Studio (pretty button on the right side bar!). This week's theme is dogs and dots. 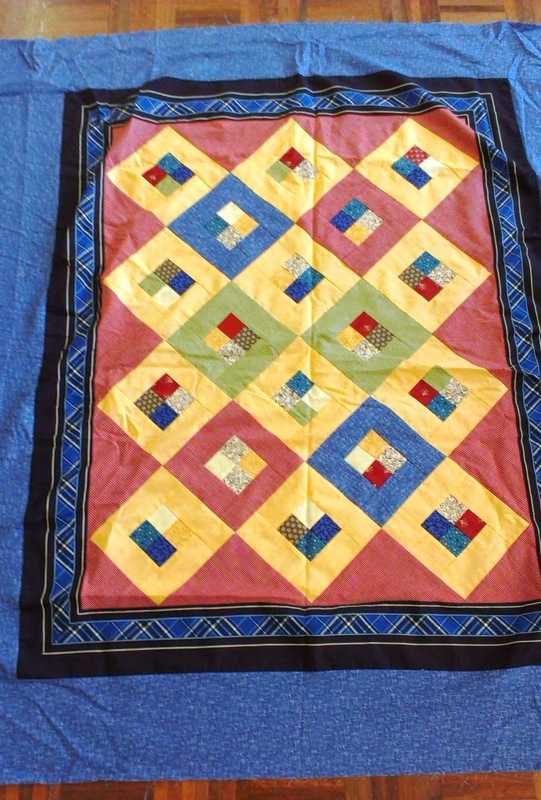 This is a quilt I made pre blogging days, so I can't link back into my archive. I am basically not a doggy person, gimme a cat any day, but early in 2013 I was asked to make a quilt for a chap for Aussie Heroes. I just happened to have a panel with Labradors on it, and this chap had two Labs at home which he was missing dearly. I quilted in his name into the section above the panel, so I have fuzzed it out to protect his privacy. Here is the quilt, held up by my ever patient Dearly Beloved. The best quilt holder upperer I know of. And I made my chap a laundry bag as well with fabrics which were in the quilt. Around the centre label I used fabric which had tiny little paw prints. And here is a photo of the chaps on HMAS Toowoomba somewhere out at sea with the quilts and laundry bags they received from Aussie Hero Quilts & Laundry Bags. You can just make out my man second from the right, with his quilt. I know its OK to publish this because this photo is actually on the AHQ Facebook page here. Your gifts of a sensational quilt, laundry bag, Aussie hat and nibbles has really touched me, my only concern is that the quilt may put a strain on my marriage of 28 years as my wife XXXX will no doubt try and coerce it from me. I am truly grateful for all the time, effort and obvious pride that has gone into this quilt and laundry bag. The quilt fits perfectly on my bunk and it already has pride of place on my bunk, in fact when I opened your parcel yesterday I was walking around the ship with it draped over my shoulders showing everyone I came too, including the CO what a fantastic quilt I had received and weren't they envious!! Another thing I wanted to share with you today is this story. On Saturday my daughter came by to have a gossip and a cuppa. Midway through her visit, her phone rang, and it was Miss 8. Miss 13 had been using the sewing machine that morning and left it up when she went out, so Miss 8 was inspired. She collected some left over squares from the quilt she made earlier this year, and cut a few more (with scissors), sewed them together into pairs, and now wanted to know if she had to iron them before she did anything else. So daughter & I went downstairs to see what we could find in my work room which might be suitable, and I sent her home with a stack of 5" squares about an inch high. Haven't a clue how many that is. Miss 8 had wasted no time at all and had sewn all the squares I'd given her together into pairs. Straight into it, as soon as she got home from school. Love my little poppet! It is school holidays next week, so I guess we will be completing a quilt top sometime. Meanwhile, if you would like to read an amazing story, head on over to the Stitching Hearts blog and take a look at this story. The last few days, Blogger has been playing up, and my reading list is a mess. For some reason, only one blog post at a time is displayed, so I have missed anything you have posted in the last 3 or 4 days. Bummer. I checked out "help", and there are a few people out there complaining about it. The official response is that it is a "known problem". But the first issue was raised on the 16th which is a week ago. What is going on?? This is a bit of a plea for help from seasoned Flickr users. I created a profile for myself on Filckr because I wanted to share my exploits in the Civil War QAL with the group which was set up for that purpose. But I have found it SO hard to use! My biggest beef is the comments. In Blogger, all the lovely comments on my posts are forwarded onto my email address as standard emails, and so I can actually say thank you to the people who have taken the time and trouble to leave me a comment, by replying to that email. But I can't see how to do that in Flickr. Problem No. 2 is the photos I load up. For Blogger I upload my photos which then get stored in Picasa. Lovely, easy to use and immediately accessible at all times. But not to Flickr. Seems I have to go through the upload process all over again. Am I doing something wrong? Bottom line is I hate it. But that is probably operator fault. As a result I really haven't used it except for the QAL. Sharon, over at Vrooman's Quilts posted a link to Val's Quilting Studio. Val has been blogging for a year, and has put up a linky party, the idea being that you link to your first ever post. I went back and took a look at mine - first time in forever. Made me smile. I had read blogs for a while, then decided that I wanted to comment, so set up a blogger profile, but me? Blog? Terrified! Finally I bit the bullet and put up my first post. It was such a frustrating experience! I really struggled with creating the blog, and with writing the post, and with uploading that photo! Got there in the end though and even managed the photo. Want a peek? Its here. Go take a look at some of the others here, its great fun. Do you remember your first ever comment? What about your first ever follower? It was so exciting. Now, 18 months down the track, I have written my 150th post, and had my 10,000th page view. Yesterday at Friday Quilters I started the next block for the Civil War QAL and last night I finished it. This is Block 4, the Canada Star. It was so funny when I started that block yesterday. I tipped all my Civil War stash out to do the cutting, and all the little pairs of eyes lit up, with accompanying "oohs" and "ahhs". A few minutes later, there was a burst of laughter, and when I turned around I realised that Raelene and sneaked up behind me and nicked a piece. No sooner had I noticed that, than I saw Fiona's hand whip across the table for a bit of paisley. And that's from a bunch of women who never use Civil War fabrics!! I am now only one block behind in that quilt along, so that is good. This afternoon, I am planning to make a few Road to Oklahoma blocks for the RSC, in yellow. The first bit of sewing I have managed this week was yesterday afternoon, and I made good use of my time by making some progress on two projects. The first was block 3 in Barbara Brackman's Threads of Memory sampler QAL. This is the New Garden Star. The colour in the background fabric looks blue in this shot, but it is actually a milky coffee & very pretty. One block down, two more to go to catch up. I am just loving working with these fabrics. There were two options - use templates or foundation piece the star points. I chose to foundation piece this. That is always a good option when you have tricky piecing and especially where there are lots of points. I found it a bit tricky lining up the stripes which I had fussy cut from the fabric, and had a couple of goes at one or two of them. The fabric kept shifting, and I ended up with the stripes going haywire. They are still not perfect, but I am not unpicking them again. The next thing I chose to work on was the project for the Lets Book it challenge Sharon is running at Vrooman's Quilts. My project this time is from an old magazine, and I last told you about it here. When I last talked about it, I was bumbling along, trying to work up the courage to cut the triangles to go on the sides for the centre medallion to turn it on point. Thanks you to everyone who offered advice. Yesterday I bit the bullet and cut those triangles. Then I prepped up one of them for the applique I want to do. Last night I started the stitching. There is going to be a yellow flower in the centre section - just ran out of time last night to fix it on. I was using the lightbox my lovely son-in-law made for me a year or two back. It makes tracing the pattern onto the fabric so easy. And the milestone?? Well tonight sometime, the pageview count on my little corner of blog land is going to tick over to 10,000. It is currently sitting on 9,999. Astonishing eh? All you guys and gals who get loads of visits have probably forgotten how exciting that milestone was. Today was Stitching Hearts day, and I drove down to Sydney. (see the logo on the right hand sidebar?? I put that on this evening). I will be writing up a post for that in the next day or so. And tomorrow afternoon we pick up the new car. Wooo Hooo!! Unbelievably it is Sunday afternoon. Where did this week go?? So what I have been up to this week apart from getting ready for that (failed) garage sale? 2.5" blue squares made up into 4-patches and framed with lime green, alternated with 6" squares. You guessed it - for Stitching Hearts. I started piecing the 4-patches at our retreat at the end of May, and have done the rest over 2 weeks at Friday Quilters. The lime green, which looks like a dirty olive in this photo, I bought in Blackheath while we were away. It really sets off the blues. Next will be a plain navy border, then a row of blue scrappy 3" squares, then another border of navy. I will use a scrappy blue binding. There are lots of off cuts in my left over bindings bin, so using some will be a bonus. I managed another 4 blocks for the June BOM for Aussie Heroes. The pattern is on their page here. Such a lovely easy block, and boy did I make some boo boos. I can only blame lack of time and hurrying. For this group I fussy cut some motor cycles. Sadly, they were just a bit too big to fit wholly on the finished block. Aren't they great? And here they are with the red & blue ones I made last week. Eight in all. That blue fabric has little Scotty dogs on it. So cute. I made 5 metres of bunting to use for the garage sale yesterday. I showed it to you wrapped around the telegraph pole in my last post here. It looked very festive, together with the bunting that Di leant me. I also showed you my first yellow block for the RSC which I made yesterday in that post. This afternoon I finished off some secret sewing. Not showing you any more than this corner. You'll have to wait awhile til the gift arrives at its destination. But the main bit of excitement for the week is that we bought a new car!! It is to be delivered next week, and is a brand new Toyota Corolla in a lovely metallic red called Wildfire. First new car in 19 years. Can't wait to have a real drive in it. More exciting news is that I have been allocated my swap partner for the Santa Sack Swap (click on that link on the right to see more). My partner is Barb and she blogs here. We have had a lovely conversation this afternoon. I have made a meatloaf for tonight. Just felt like some comfort food. For dessert I've made Sticky Pears. I found it at the Monday Morning Cooking Club blog. I heard an interview with a couple of the ladies from MMCC a couple of weeks ago on the raido, checked out their blog and found that recipe. I made it a day or two later when my cousin, who lives in Canberra, visited me for dinner. They were yummo, so I thought we could do with some again tonight. This evening I am planning to curl up in front of the TV and finish off the last couple of red flowers I have been appliqueing in the last few weeks. Same plan as for "Purple People Eater" and "Green Beans Please". This one is not very original - "Roses are Red...."
I will link this up with Slow Stitching Sunday later tonight when the link goes up. Click on the link to see what others are stitching tonight. The colour of the month for June for the Rainbow Scrap challenge is yellow. I had an hour of blissful stitching this afternoon after the Garage Sale, whilst ignoring the chaos around me. I managed my first yellow block, and chose to do the Road to Tennessee block this time. Linking up with Angie at Soscrappy. Go on. Take a look at what the others have made this week. We were up at sparrows this morning to set up for the garage sale. We couldn't anything much last night because the area we set up in was not secure. Bunting on the telegraph pole and on the car port. Miss 11 did the 3 signs for me. Two were out on the main road and this one was facing the traffic coming down our street. It was a totally miserable day. Raining until about 11.30, and cold! Didn't deter the bargain hunter who arrived at 6.50am just after we had started setting up, and while it was still dark! We (my daughter & I) set up in the paved area at the front of the house because there was more room than in the car port. It was also sheltered from the rain. Looking from my daughter's end up towards mine. We had about half the "stuff" each. This is from my end. The result was pretty disappointing. The ad was not in the paper, so we relied on the Second Hand Saturday list on the Council web site (which was hard to find), and the signage on the road. Plus the rain was off putting I'm sure. Not a good return for the hours spent on sorting, pricing and set up. The best customers came when we sent Miss 13 up to the main road to wobble board. We sold more in the 45 minutes she was up there than in the entire morning! We packed up at midday. Well you live and you learn. Since it has been cold and bleak lately, I made a yummy soup over the weekend. It was a freebie recipe from the Coles magazine, and it was called "Quick Bean & Ham Minestrone". If you are interested you will find the recipe here. The recipe called for a ham hock, but I had the Christmas ham bone in the freezer, so was dead pleased to use that up. One of the key ingredients was Kale, which I had never eaten, so that was another reason I wanted to use the recipe. We both thoroughly enjoyed it, and I will be making this again. Next time though, I am going to try it with Silverbeet instead of the Kale, see which of the two I prefer. Now I have realised that anyone o/s will need a translation - wuss = wimp. (giggle). My work room is a tip! But look at the satisfying bunch of stuff I am putting out. This all came about because a friend asked me to dispose of "some" craft stuff when she was downsizing. What arrived was an absolute truckload! I was able to dispose of some of the things to various places, but when I tried to take the Folk Art supplies to the craft op-shop I go to, they refused it because they can't sell that sort of stuff. By this time my friend had sold her house and left for a country town, so well out of reach for me to return it. I decided to try to sell it and give the money to charity. Once I had made the decision to sell it, I thought of going to a car boot sale, but that seemed like a lot of hassle, so garage sale it is. My daughter is going to set up a table too, so I'll have company, and there will be more variety of goods. Not all the stuff is from my friend. I decided it would be a good plan to cull some of my excess as well, so I have been through my cupboards. What a great feeling! Whatever doesn't sell on Saturday, I'll give to the Salvos - they have a big op shop near us. I am planning to give the proceeds of the sale to Stitching Hearts. We badly need some yardage for backings etc. I've been using my cutting table as a sorting depot. This afternoon, I cleared a corner because I had had enough of sorting, and was desperate for some sew time. Just look at this mess. Tidying that up will have to be my job for next week after the sale. And I am not going to show you the table in my work room. That is even worse. Such a simple pattern! Yet I managed to make a mess of it on the first block. Booooo Hissssss. Once you make the 4-patch, you are supposed to make the first cut at 5.5" from the left edge, and then another 3.5" further to the right. Well I made the first cut at 5" didn't I, and didn't see my mistake until I had made the second cut. And of course I didn't have enough of the red fabric to simply replace the damaged bit. I ended up piecing together two smaller pieces. Then I noticed that on the second block I made, the stripes on the cream blocks AND the brick pattern on the red, were going every which way. Bummer! So I unpicked that block and remade it with all the stripes and the bricks going the right way. I guess there would be lots who wouldn't have done that, but I just couldn't leave it. This afternoon's post brought two cute little stitchery patterns I ordered from Michelle Ridgeway who blogs here. Here they are, complete with the shadow of me taking the photo. I can see me using the alphabet a lot, and the little Christmas decorations will be fun to stitch. You can see the rest of the lovely designs she sells on her blog. The other bit of sewing I have done this week I shall have to show another time. It has been rainy and dull, so the photo I took was crummy. I'll wait for a bit of sunshine to take another. Each year it has become a bit of a game that there is a challenge set at the Retreat, and this year Jan raised the stakes very high. On Thursday night we were each given a paper bag in which there were 12 different items - fabric, paper clips, pipe cleaners, styrofoam ball, cupcake wrapper, rubber band, feather etc. We were asked to make something out of them - we had to use 10 of the 12 items; we could add up to 2 other items; we could take additional items from the extras Jan had brought with her. The reveal was at 8am on Saturday, when we had to vote for the winner, and there was a prize. How I feel sometimes LOL! The winner - difficult to see from the photo, but the two feathery objects are swans. That's it folks. No more retreat posts til next year. Green Beans Please Needs Borders. First of all, could I say thank you to all the lovely people who voted for my quilt Summer Evening in a Garden Maze in the Bloggers Quilt Festival. There were some pretty spectacular quilts aired. When all was done and dusted, my quilt received 20 votes. Not enough to take prizes in its category, but boy I was chuffed with all those votes. So thank you lovely bloggy friends for voting. In my last post I told you about the lap quilt I am making for Stitching Hearts, which I called Green Beans Please. Well on Friday morning, I got it all together, and it needs a couple of borders to get it up to lap size. And that is where the problems started. On Sunday morning I went up to 2 of the most likely shops here on the Coast to see if I could buy some green plaid fabric. Not a prayer! No plaids anywhere, let alone in green. I ended up with two fabrics, neither of which thrills me greatly. I was thinking a frame border of solid, then the green plaid, then the frame repeated. 1. In this photo - a green check fabric on purple on the right, and a sort of check green batik on an olive green solid. 2. This photo is the two fabrics switched, so the batik on the purple and the green check on the green. 3. And for the last photo, I found an emerald green in the cupboard with the same green check and batik as above. The green check on both green solids looks horrid and the emerald green is the wrong green for the batik, so I am left with the two options with the batik. On balance I think I prefer the batik on the olive green, but I don't mind it on the purple. I am not over happy with the batik in this quilt mostly because there isn't a whiff of batik in the quilt top. Any comments on the choices?? The rest of the week is busy - 3 times down to Sydney on three consecutive days, and then on Friday sewing in the morning, and a bridge comp in the afternoon. At least it is a public holiday on Monday so its a 3 day weekend. Probably won't get a chance to read any blogs, let alone write any posts. So, Til next time.....Keep on stitching.